who wants to dress up like a zombie with me at coachella? we can stumble into groups of sweaty urban outfitter dorks and swipe at the air and act gross and pretend to try to eat them and completely invade their major coolness? i'm off to a land of neon and krAzy. and thom yorke. and hologram tupac. 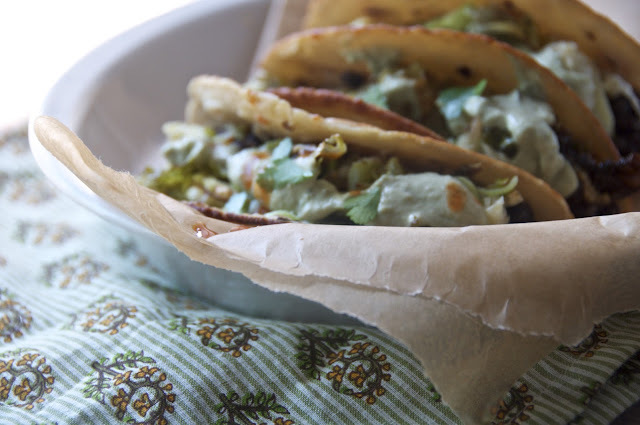 but before i go i need you to take a look at these tacos. these tacos are doing something here, besides being tasty. these tacos here are acting normal, like they're just regular tacos. 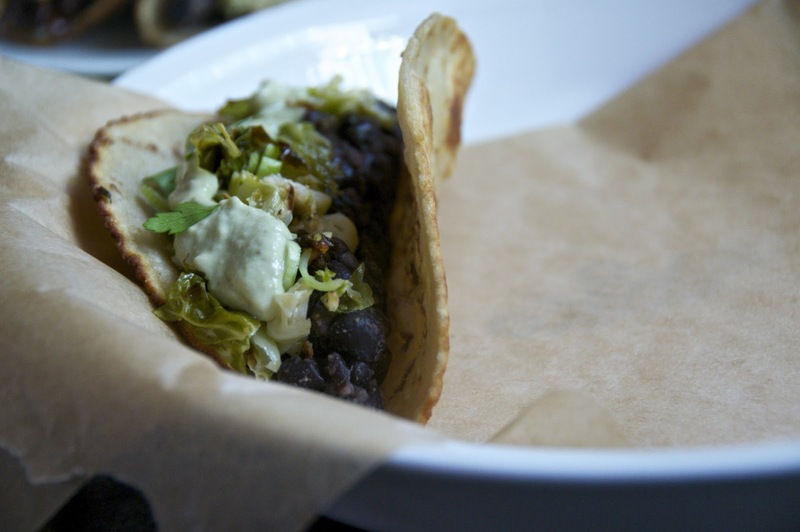 they've got the tortillas, the cumin-spiced beans, the limeyness...classic suspects in the taco species, right? ...this taco is doing what i do. when i meet people, i act super normal. i feel myself doing it all the time, acting quite nice and normal. brussels sprouts and parmesan. hey, you guys are weird to find in a taco... weirdness hiding in the normalness. like! topped with some avocado crema, these half normal half wacky tacos are so. so. awesome. i should learn a thing or two from this shouldn't i? 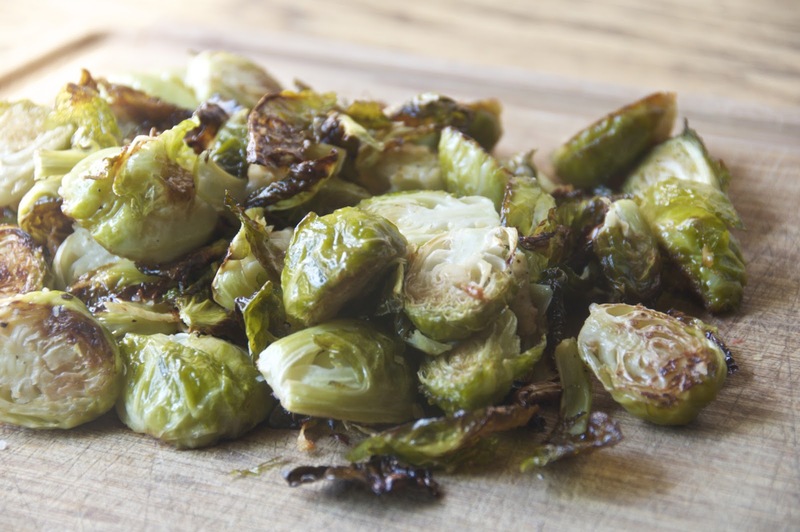 i should try to be my weirder, less sickeningly nice self when dealing with brussels sprouts.
? nevermind. that's not the lesson at all. it appears that my brain has already checked out. 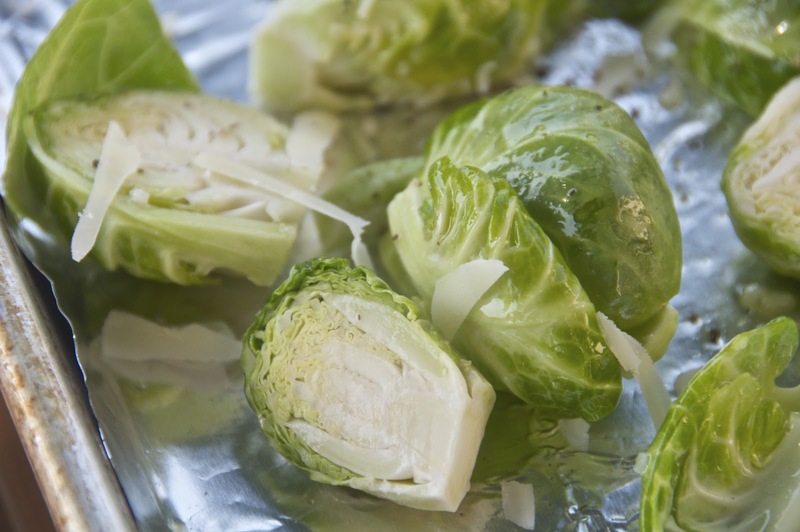 preheat oven to 400. wash the brussels sprouts, peel the outer leaves and halve. toss them with olive oil, a generous sprinkle of coarse salt, pepper, and handful of parmesan. spread on a baking sheet and roast until crispy and a bit browned, about 25-30 minutes. let cool a bit, then chop them up a bit. 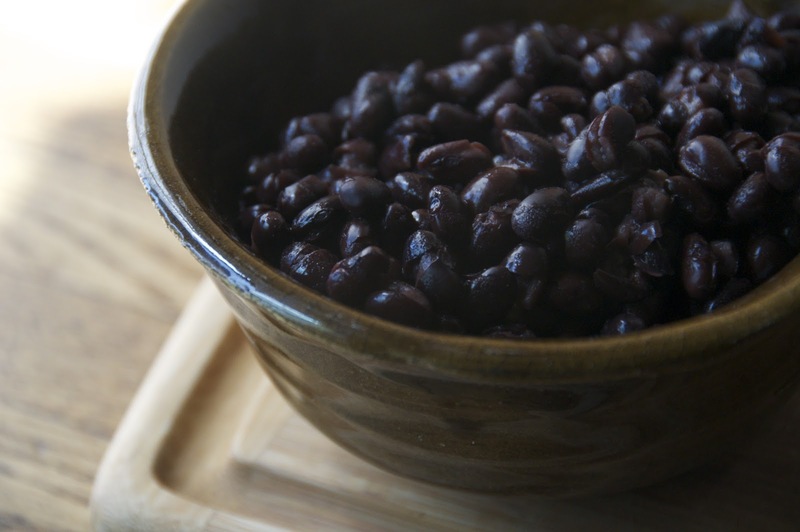 place beans in a bowl and mix with cumin, salt and pepper. slightly mash. to make avocado crema, mash the flesh of the avocado well with the lime juice, sour cream, salt and pepper. heat 2-3 tbsp olive oil over med-high heat in a large skillet. place 1 or 2 tortillas in the pan and place two generous spoonfuls of black beans into the center. fry for a minute. then with metal tongs, fold over and fry on each side until browned and crisp, about 30 seconds on each side. repeat with the rest of the tortillas. 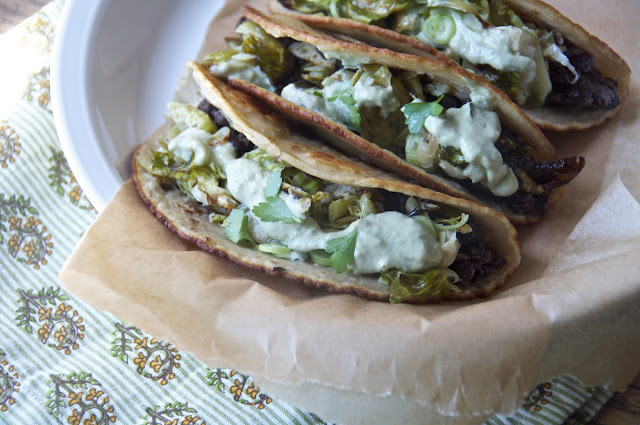 stuff each taco with the chopped brussels sprouts and top with the avocado crema, sprinkle of green onion and cilantro and hot sauce. feast! 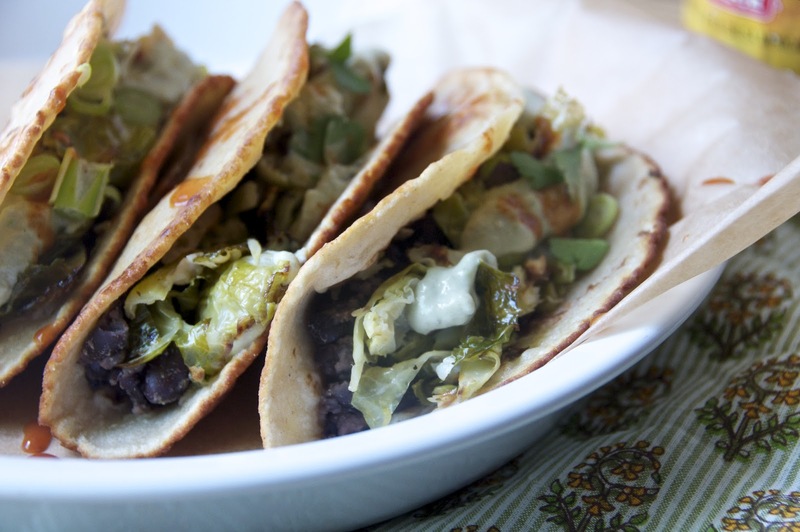 Never thought to use brussels sprouts in tacos. Looks great, thanks for sharing! I made this tonight and it was so so so so so SO SO SO delicious. Thanks for the brilliant recipe! Oh, I added some garlic salt to the beans, which helped make them stand out a little more. Otherwise, followed word for word! These were absolutely wonderful! I've just finished eating two and can't wait to put the ingredients back together for dinner tomorrow night! Thanks for a great veg recipe! My wife and I made this a few times already. It's been great every time. That's my hubby just above my comment. I came on here to say we made this again last night and are totally obsessed with it (it has become a weekly staple in our home)! 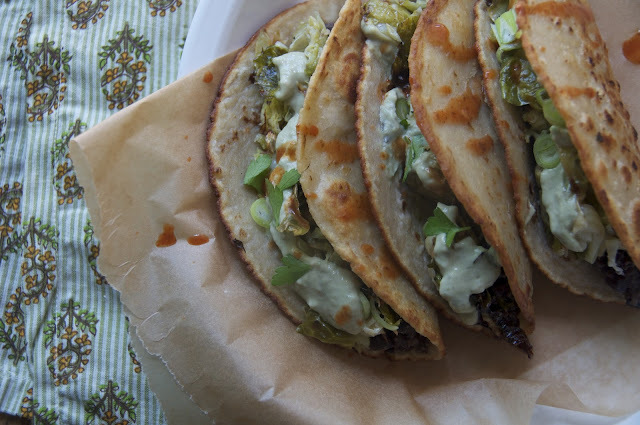 We have made this for friends and family and converted "brussels sprout haters" to lovers and have been asked for this recipe many times after our dinners. Thanks for sharing this! It's so delicious! Thank you for this fab recipe! My husband who recently had a heart attack and will eat about anything that's in a tortilla loved them! (So did I) As a Mom to 3 kids under 3 it's rarer even get to cook, but this was easy and healthy and I am so appreciative! i cant wait til my brussel sprouts are readyy. these look so good.